I'm trying to migrate our user menu to Barcelona user menu. Unfortunately, it does not support "submenu" like California does. 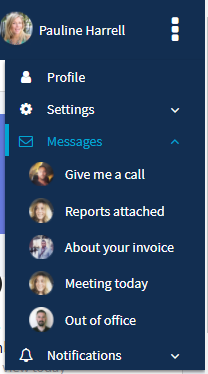 Is it possible to port California user menu to Barcelona please? There codes(HTML, SCSS and JS) that an example of profile menu in California. You can use and edit them according to your need. It's not certain yet. We'll discuss with team members. Of course we try every code that sent to you and we check out is it working on themes. I tried codes on Barcelona and it is working. I believe you can make it work without struggling. Is it possible to provide a patch instead? It would be a lot more easier for us to apply the changes. Unless you plan to integrate these changes in the next realese? We don't plan to integrate these changes to Barcelona.